If you are looking for value research based multibagger stock ideas for wealth creation, then you are at the right place. We are registered with SEBI and have been recognized by none other than Forbes and Economic Times (ET) for our stock research prowess. Below, you can read more about our service offerings to our members. You will get detailed and easy to understand reports (covering sector analysis, detailed analysis of the past record of the company, Management details, shareholding pattern) on New multibagger stock ideas every year. Can be purchased at valuations where the growth component of value comes free. Special situation opportunities constitute opportunities arising out of announced corporate transactions such as De-listing, Open offers, rights issue, de-merger, bankruptcy restructurings, etc. If carefully chosen, these opportunities offer high margin of safety because they are too a large extent immune from regular market risks and volatility. At the same time, the holding period in general for such opportunities is 3-6 months. The model portfolio service is basically an extension and reflection of our research analysis and the sole purpose of the same is to determine performance of our research analysis on portfolio basis than on individual stock basis. It is basically a Performance measuring tool, similar to say an index. 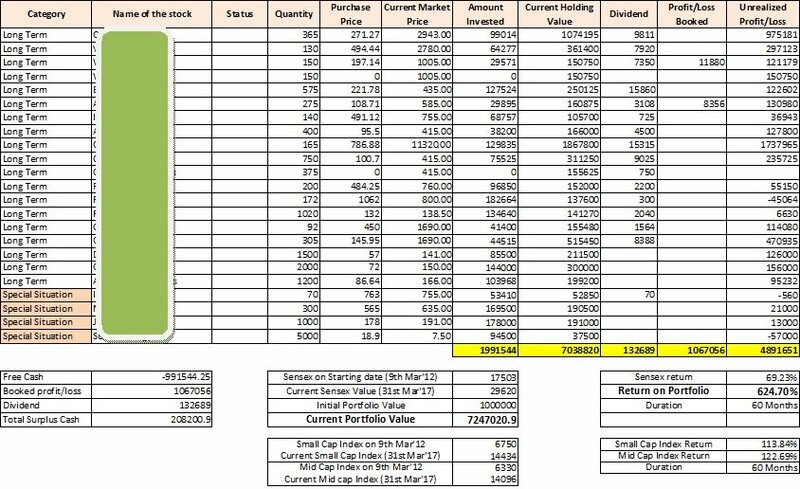 Until now we had been offering stock recommendations; however with model portfolio we will arrange those stocks on say an imaginary corpus of Rs 50 lakhs with occasional buy/sell transactions and addition deletion of stocks in the portfolio and share the details across with the members. Receive e mail and sms notifications when a new report is released or an important update is released. Detailed reports on multibagger stocks shared with our members during the last 12-15 months. Get the latest news on our recommendations straight from the research pit, so you’ll always know exactly where our recommendations sit and where they’re headed next. Our reports and updates will help you in evaluating businesses and in understanding the ins and outs of financial statements to valuing companies. The objective is not only to give you good stock ideas, but also make you an informed and intelligent investor. Most Important Question: Are our subscriptions suitable for you? Who looks at ownership of stocks as partial ownership of businesses? Who is patient and serious about exploring high quality businesses? Who understands the fact that stock prices are the slave of earnings and sooner than later they start reflecting the same. Who doesn’t have a phobia of watching his stocks go down over the short term? Who is patient enough to hold a good undervalued stock for a period of 1 year and more? Who does not get enough time to research. Who researches and invests himself, however looking for a source of good research analysis on stocks. If you believe in our philosophy, then one of our Premium subscriptions is suitable for you.